In this quick tutorial, we will show you how to set up webhooks, as described in our CI/CD feature, on Docker Hub. Let’s assume you already have an account at Docker Hub and set up a repository. 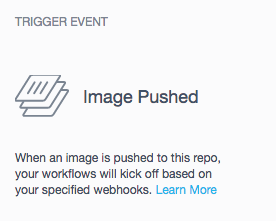 Now, navigate to the webhooks tab of your repository. Docker Hub only allows us to trigger actions when new images are pushed, so there is nothing to configure here. Then give the webhook a name of your choice. We’re using “webhook test” in this example. Paste the webhook URL you’ve copied from the sloppy.io Web UI, then save the new webhook. And that’s it. You’re set up. The next time you push an image to this repository it is automatically deployed on sloppy.io. If you want to set up webhooks on quay.io, please follow this link.